Give your truck that zoom without breaking the bank. Can you think of a better way to get fifty bucks? Buy an NX nitrous system and we will write you a check for $50.00 to do anything you want with it. $50.00 rebate applies to retail purchases by the end consumer of a Nitrous Express Automotive nitrous system purchased between October 1, 2009 and December 31, 2009. This offer does not apply to accessories and/or individual nitrous system components. To claim the rebate, the consumer must mail the completed rebate form along with a copy of the original retail receipt and a portion of the end flap of the carton with the UPC code and part number of the nitrous system purchased to the address above. Claim form and above documentation must be received no later than January 30, 2010 to be eligible for the rebate. Nitrous Express is not responsible for lost, late or misdirected mail. Offer cannot be combined with any other offer. Offer is not eligible for wholesale purchases (sales below current published MAP price). Required proof of purchase may not be mechanically reproduced, traded or sold by any individual or organization. $50.00 Rebate applies to NX branded automotive nitrous systems only. Rebate does not apply to Incognito, MainLine, Motorcycle or R/C nitrous systems. BD Diesel assists with development program. Christian places BD DIESEL decal on the Hawk. He is the person that steered the project from a 2 liter tdi to 4 litre Cummins and built the converter drive. BD Diesel is always a valuable resource for any diesel requirements. Brian Roth and son, Christian were checking out the Goldenhawk when we stopped at the Valley Fuel Injection location in Abbotsford,BC. Most everyone knows BD Diesel for their knowledge and great parts and service on diesel vehicles of all types from pick ups to large motor coaches. However, they also have transmission and converter shop. That is where the direct drive assembly was designed and built that allows a 330 mile per hour car run without an oil cooler. No slippage -no heat! Brian and Christian with Goldenhawk 26 August 2009. We are discussing the possibility of running it on BD DIESEL's dynomometer. Watch for video of the test runs!!!! There are several comments that fans make about the streamliner, like, "is it a plane, where are the wheels, is it really a diesel and THAT'S A PRETTY NICE TRAILER!" When you hear the last one you can be sure it is from someone that knows and uses trailers. Thanks to Cummings for the care and planning of the transporter for this special application. It is always good to see the sponsors placing their logos on the car! I just know that each of the sponsors is the best in their field and so I feel that it is only fitting that they place there signature on the project personally. Thanks for the great cam shaft, it is the heart to our high rpm, high output diesel! COLT is the King of cams. Rookie Run for streamliner and pilot! It is in preparation for the record attempt and to meet the requirements of SCTA/BNI safety rules that require every "new on the salt" driver and car to demonstrate both mechanical and mental readiness to the safety team and the driver 's team. In our case it proved very informative. I learned about the steering and handling of the Goldenhawk, its acceleration and directional stability. I also learned what to expect of the deployment of the chute. Most importantly I learned what we need to change to improve ergonomic of the cockpit. We will change the shifter position, the instrument panel, the steering wheel, brake and throttle positions, head restraints, leg restraints, and quick release for parachute anchor. All of these changes are in the works as I write this and more innovations are planned. I will post the progress as it happens. Yuri Tofini pionts the Goldenhawk to the start line. Dr. Glenn Dyck is worth seeking out to get eye examinations annually. 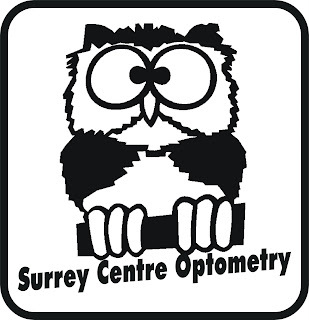 Surrey Centre Optometry on King George Highway is well worth the drive. I have been a regular patient of Dr.Dyck's for 14 years and have had good satisfaction with reception service, professional testing and sound advice. Their frames and contacts are very reasonably priced and friendly follow up is assured. So come, Mom , Dad, Grandparents and bring the kids because it is a whole family service. Now, the unexpected pleasure of receiving his more than generous, sponsorship (the trailer) for the GOLDENHAWK, proves he has an eye for the future. Perhaps we will coax him to drive it! Be sure to mention you are a Goldenhawk fan when you make your next appointment and maybe you will get a poster of the Goldenhawk Team. 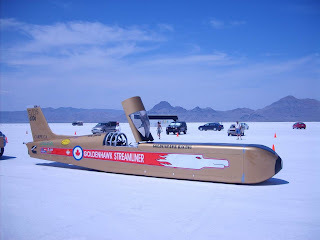 The Goldenhawk team would like to acknowledge and congratulate The Swamp Witch E/Diesel Streamliner team from our American neighbour, Washington state. Running on an open record, driver / owner, Eric McClain managed to set the bar at 156.171 MPH. give us a target to aim for but also (if they are receptive) to share technical information and support. That Eric's team has set a bench mark gives us a reason to put the Hawk in 4Th gear and turn on the overdrive! I am sure they are stirring the Calderon as you read this to brew up more speed. Leaving Wendover "Wave Goodbye to Will "
Good weather and scenery to enjoy for next 20 hours. SURREY CENTRE OPTOMETRY tri-axle trailer is towing smoothly and Maggie May's Motor home is just purring along. We expect to stop to nap someplace in Oregon and be home before dark Saturday. (truly AWESOME) spectacle of the "BRIGHT WHITE" and experience the spirit of respect that fills the air. Respect not just the environment but for each person it seems to bring out the best qualities in them. 10 day week a Race Odyssey winds down! The time has come to Load'r up and mov'r out. whether at toil, riding a bike or reading a book an adventure was had by everyone, eating Mexican food at Taco Poblano, the Salt Flat Cafe or the casino Buffet. everyone receives big hugs, hand shakes , hi5's and kisses goodbye. "Thanks for the great time and see you next year for the record"! Crew chief, Yuri and his most supportive family and team players. It is a sweet feeling the first time you deploy the chute on a new racecar. The dragsters were thrilling but this time it was real special. Thanks to DJ Safety the design is perfect and the hit is soft and firm. 6006 E/DS "The SMOKES ON"
It runs strong! Effortless to 3650 rpm. Suit up, belt up and thumbs up! Getting suited up is a quite difficult procedure it takes about three people to help get it all on. Thanks to Annie and everyone I get all dressed and strapped in the car. Before you run the starter comes over and checks and tightens the belts! Yuri and Jamie make a further check of the cockpit, Dan pulls the safety pins and shows them to me. All systems are go Werner and Chris are in the push truck, Dean and Bryson are heading for the motorhome to pick me up at the return road. The cockpit is latched down, I am cooking in the heat and fire suit. Yuri gives the thumbs up and we move to the line. The trip to the Starting line is 4 miles! Feb. 3 2007. Now thats remarkable! Posing for photos with sponsors shirts. NITROUS EXPRESS ( NX) are the Red. Thanks for the shirts and all your product support plus the encouragement of all the sponsors throughout the many months to this moment. There comes a moment in any journey, when the sweat and labours of the climb up a mountain are worth the toll. That moment is when the team stops to admire the view. Many people have said how much they loved the look of the car but in the flurry of activity during the past week, this is the first time all work stopped as we proudly congratulated each other on a job well done. Last minute checks are done! Time to hit the salt! The crew pushes the GOLDENHAWK STREAMLINER onto the Bonneville Salt Flats 13 August 2009. They stop to look at it sitting in its natural environs. A long journey is approaching another milestone. The car is off the landing gear and the body is put back on. Jamie's GPS will be our guide to keep within the speed limits for shake down and licence runs. Tomorrow will be the first runs. The engine seems good and the rest of the car is checked for loose bolts etc. What a crew! Everyone just worked their butts off trying to find the reason the tach didn't work. Sometimes it flashed up and then dropped. Dan, Jamie and Yuri were assisting Werner chase the problem around the wiring. Unfortunately we have no wiring diagram for the tach and it doesn't seem to understand it is reading a diesel magnetic pickup. As usual when this happens, in the maximum stress situation, we manage to create a dead short and the wiring begins to fry. No serious damage occurred but the beautiful wiring job that Werner had worked weeks making perfect fell victim to the gremlins. I feel very bad for Werner as he is stressed to the end of the line. Final decision is to "Run What We Brung "